Powering Business Online Since 1999. One Web Source is a CT web design company that delivers what businesses need – qualified leads, increased sales, brand awareness, user engagement, loyalty programs, improved search positioning, online promotions and more. 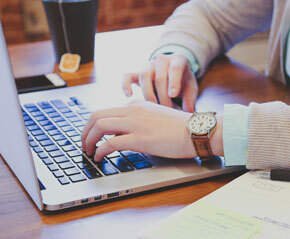 Our team creates digital strategies that help you reach your goals. From carefully placed customer calls to action to performance measurement & conversion reporting, we work hard to make sure our digital marketing solutions impact your company's bottom line. We've been helping businesses large and small increase sales and reach online goals for 20 years. Corporate clients appreciate One Web Source's quality, innovative approach and responsiveness; small businesses are happy their projects are handled with the same creativity and care we provide large companies. Want to see how you can get stronger sales results using digital marketing in 2019? 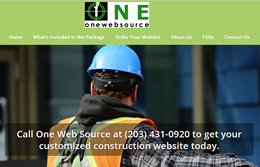 Call (203) 431-0920 or onewebsource.com to get started today! 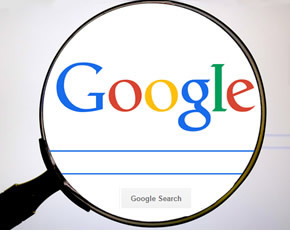 It's easy to control how your business appears in Google – search, maps/local and on mobile devices. We offer complete digital marketing services for business. If you don't see it here please ask. 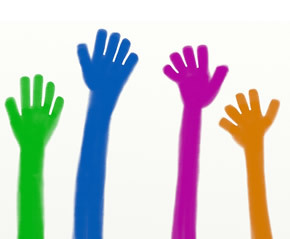 Call for a Free Website Analysis! We designed & developed a website for Tandberg Educational to introduce its line of cutting edge digital language learning products and services. There are four distinct customer target markets, each with their own concerns. We created a section for each to facilitate communicating distinct messages to each and generate leads. Their customers are happy with the site and we think our customer is too! Ridgefield Apartments needed a new website to represent and help manage their high-end, impeccably-maintained apartment rentals in beautiful Ridgefield CT. We designed and developed this WordPress site so they could easily manage their rental inventory themselves. Visit Ridgefield Apartments, responsive property managers and purveyors of the very finest apartments in Ridgefield CT.
We're pleased to work on projects with Pyramid Real Estate Group and happy to lend a hand with their Google and Bing/Yahoo! search ads to drive local targeted traffic looking for their services. 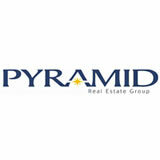 Founded in 1972 in Stamford, CT, Pyramid Real Estate is a full service real estate company. If you're looking for best-in-class condo management, commercial property management, maintenance, construction, or leasing / sales brokerage services visit Pyramid Real Estate Group. Make Beliefs Comix is a free comic strip creation website with a large and growing international user base. One Web Source works with the site's visionary creator, Bill Zimmerman, to develop digital strategies and implement solutions that have resulted in growth from 0 to 1,000,000+ (1 Million+) page views/month. Growing targeted traffic helps ensure the site remains supported by (family-friendly) ad revenues. Managing ad inventory on a high-traffic website and two iPad apps where the audience is largely students and K-12 educators requires ad quality vigilence. Our digital marketing strategists help grow traffic while balancing the types and quality of ads to maintain a site that's friendly to its user base. Visit MakeBeliefsComix.com, download the FREE iPad app or the $1.99 AD-FREE iTunes iPad app to create your own comic strips. Dr. Lin Lougheed is universally recognized as the leading authority in test preparation. The author wanted a website to house his body of work. 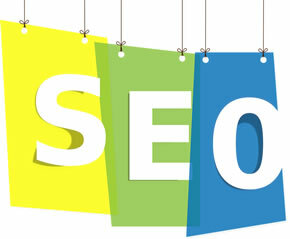 One Web Source designed and developed the website so it would be accessible to English language learners, and included key elements for search engine optimization (SEO). Dr. Lougheed's website was quickly picked up by search engines and continues to be popular worldwide in the ELTS, TOEFL, and TOEIC exam test preparation community. Pirelli Tire needed some expertise for an internal .NET framework project. A One Web Source .NET developer arrived onsite with tools to assist the Pirelli team to design and manage the project. We developed a visual technical mapping for Chase's international IT infrastructure. It took a team of programmers, designers and diligent Q/A and project management to document this highly complex environment for use during technical orientation at Chase. Eve Siegel is a talented designer specializing in book jackets and covers. She has designed hundreds of covers for respected publishers including McGraw-Hill and Oxford University Press. 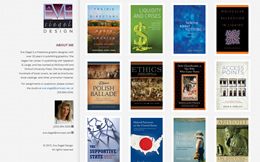 Eve also designs brochures, book catalogs, and other promotion material. We distilled 17 years of building websites down to 133 key ingredients for a successful construction website. For construction companies, builders, general contractors, electricians, plumbers, carpenters, engineers, home improvement service companies and more, this 5-page contruction website at $599 plus $49.95/month including 3 hours or updates with a 1-year commitment is the best deal in town. See what you get in our customized construction websites starting at $599. 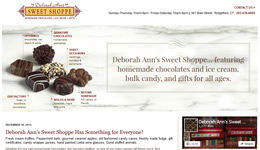 Who can resist Deborah Ann's Sweet Shoppe in downtown Ridgefield CT? They needed a place on the web to announce a few details about their location and when their sweet shoppe was open, so we set upon the task. We designed a simple two-page interface with Facebook feed and an expansion module so they're ready to add on later. When in Ridgefield stop by Deborah Ann's and pick up a tasty treat or gift.